100% natural. Ready in 3 mins. In the microwave or on the hob. 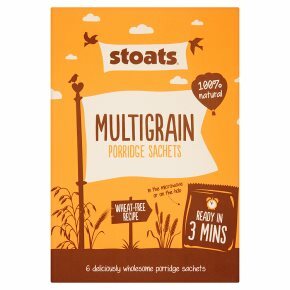 6 deliciously wholesome porridge sachets. With super-healthy chia seeds. Made using our own, unique blend of premium Scottish oats. Perfect for home or work. Wheat-free recipe. Suitable for vegetarians.We love seeds almost as much as oats. They taste good, they look good and they do you good. So it's no surprise that pumpkin seeds, chia seeds and linseeds all make an appearance alongside the premium Scottish oats, barley and rye in these deliciously wholesome Multigrain Porridge Sachets. Oats, rye and barley are all Ancient Grains. That basically means they're good, wholesome grains that are still grown just as nature intended. Their simple genetic make-up means they're easier to digest. They're also packed with protein, fibre and omega-3. No wonder these wee grains get a big thumbs up for providing a healthy, nutritious and balanced diet.